Ford, Ram, and GM have promised to post half-ton truck tow ratings to the Society of Automotive Engineers' standard known as SAE J2807 for the 2015 model year. GM committed and we're still waiting on Ford, but Ram has taken an extra leap adhering to the standard for half-ton, three-quarter, and mighty one-ton pickups. What Is SAE J2807? What Does It Really Mean For Your Pickup Truck? SAE J2807 is basically a specific set of testing procedures that are meant to standardize the way in which pickup truck manufacturers set the "tow ratings" they put on their vehicles, which are now somewhat arbitrary and unsubstantiated. Each automaker agreed that they'd measure towing for half-ton trucks to the SAE standard a few years ago, but Ford backed out at the last moment so it didn't happen. The promise was rewritten to go down for the 2015 model year, and this time it seems like it might actually be happening. General Motors delivered on their promise to adjust their towing ratings for the 2015 model year and saw a negligible drop across most half-ton models. Ford maintains that their tow ratings for the 2015 F-150 will also adhere to the standard, but of course the performance specs on that truck are still being kept on the down-low. As of July 16th, Ram has adjusted the tow ratings on not only their half-ton trucks, but across their entire lineup, to reflect towing capabilities as measured by the SAE standard. * Ram says "Best In Class"
Standardization is good; hopefully this will inspire the other automakers to adopt SAE J2807 for their larger trucks and keep Ford from bailing out on their commitment to equal measuring methods again. 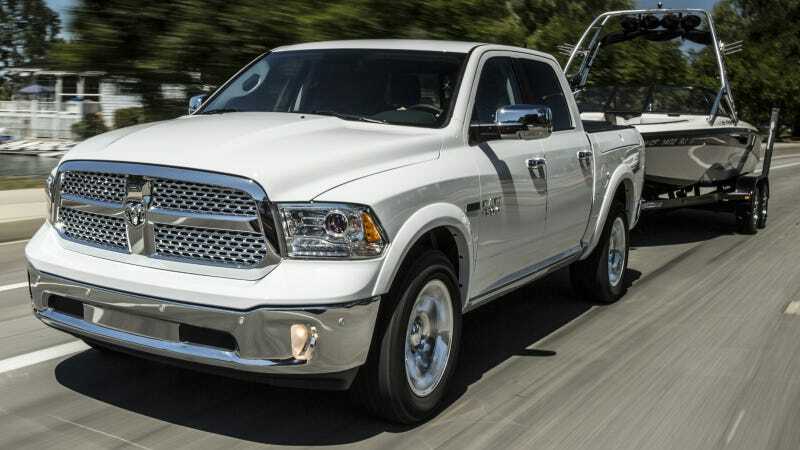 Is it a coincidence that Ram decided to make this announcement on the same day Ford trotted out their new Super Duty three-quarter and one-ton trucks? No, probably not. The monstrous Ford F-450 is now advertising an insane 31,200-pound towing capacity and 40,000 gross weight max. Ford, Ram, and Chevrolet's PR people will argue all day about this stuff. Since this post went live, Ram's folks insisted their heavy-duty one-ton truck wasn't a direct competitor to Ford's F-450. Ford was then quick to claim that the F-450 is in the same weight class as Ram's 3500, and is only a slightly uprated F-350 rather than a chassis-cab with a pickup bed.